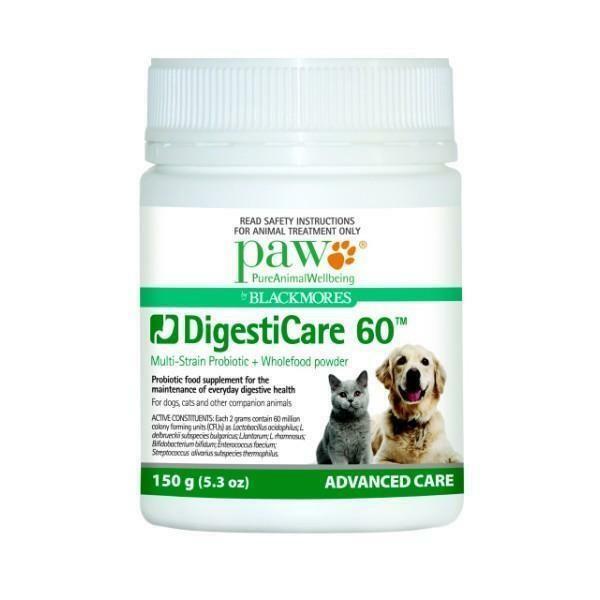 PAW Digesticare 60 150g helps dogs, cats, and other companion animals to maintain a healthy digestive system. Digestive issues can often be messy and distressing to both the pet and the owner, so finding solutions to support digestive health is important to any pet care provider. Digestive Health is also an important consideration in all areas of a dog’s health and wellbeing. We all know the saying – ‘we are what we eat’, but really, ‘we are what we absorb’. We also know that 80% of the immune system resides in the gut so having the right microflora and ensuring a healthy digestive system can, therefore, help improve many areas of health. Dogs & Cats with minor intestinal dysfunctions (gas, diarrhea) caused by environmental changes (stress, travel, diet). Puppies & Kittens and other immature companion animals. Multi-strain probiotic with wholefood powder for dogs, cats, and other companion animals. Lactobacillus acidophilus; L.delbrueckii subspecies bulgaricus; L.lantarum; L. rhamnosus; Bifidobacterium bifidum; Enterococcus faecium; Streptococcus alivarius subspecies thermophilus. Aids during a period of intestinal dysfunction, including treatment and diarrhea. Aids in the establishment of gastrointestinal microflora of physiologically immature animals (puppies & kittens). Fermented Superfoods including Spirulina, Quinoa, and Alfalfa to provide easily absorbed nutritional support.